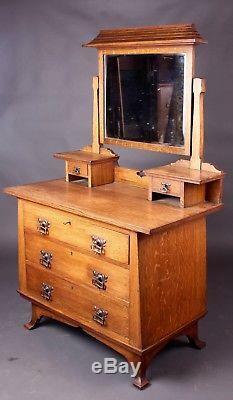 Arts & Crafts Oak Bedroom Set Wardrobe and Dressing Table Possibly for Liberty. We don't allow unhappy customers! The only way you get this is by serving your customers well, being polite, punctual, responsive, courteous and most of all professional. Viewings welcome at our shop at 57 High Street, Heathfield, East Sussex TN21 8HU or our storage facility by appointment. A beautifully designed bedroom set from the English Arts & Crafts Movement crafted in solid oak. 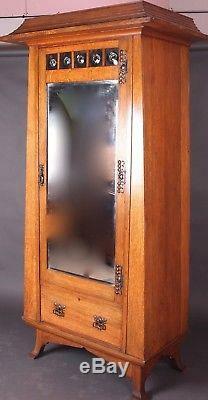 The'A' frame wardrobe with rare and unusual pagoda shaped cornice. The door having a bevelled mirror and bullseye glass panels above. 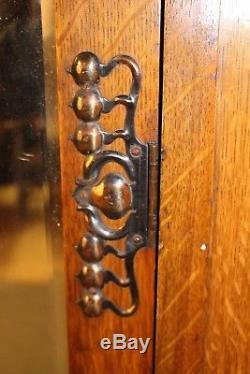 Fitted with delightful Art Nouveau stylised tulip copper hinges and lock. 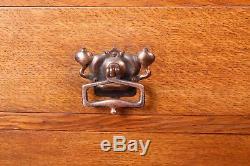 Single drawer with matching copper handles. The whole standing on splayed feet. 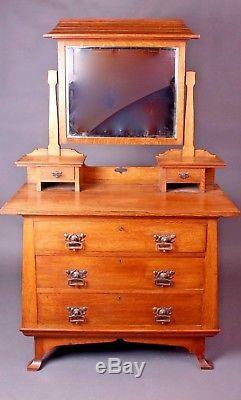 The dressing chest with matching pagoda and bevelled mirror. Above two trinket drawers and three larger drawers again with original copper handles and standing on splayed feet. There is a stamped serial number on the wardrobe drawer which we are currently researching to hopefully trace the maker. Dressing chest measurements: 160 cm high x 100 cm wide x 55 cm deep. Wardrobe measures: 212 cm high x 102 cm Wide x 40 cm deep. If you are local within a 30 miles radius of TN21 we will often deliver next day but please always check as we hate to disappoint our customers. You are also more than welcome to collect from us by prior arrangement. You may also be interested in.. A Victorian Satinwood Breakfront Compactum Wardrobe. A Pair of Antique Venetian Urn Lamps Early C19th. A Vintage ENT Medical Floor Standing Bullseye Lamp Mid C20th. 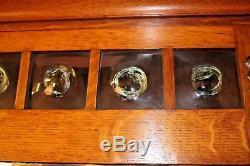 Early 20th Century Cut Glass Wall Light Scones. 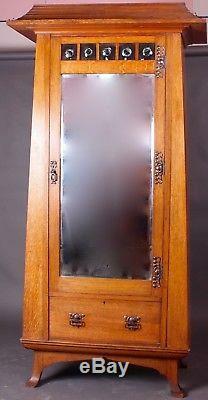 A Fine Victorian Mahogany Cheval Mirror. Orkney Chair of Small Proportions in Pine and Straw, Circa 1970. Black Leather Buttoned Back Club Sofa Reduced To Clear. Victorian Mahogany, Brass and Cast Iron Music Stand. 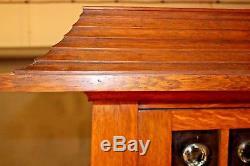 A Large Antique Victorian Aesthetic Movement Oak Dinner Gong. 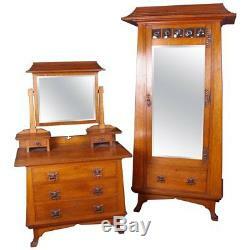 The item "Arts & Crafts Oak Bedroom Set Wardrobe and Dressing Table Possibly for Liberty" is in sale since Saturday, December 09, 2017. This item is in the category "Antiques\Periods/Styles\Arts & Crafts Movement". The seller is "tinkerandtoad" and is located in Heathfield, East Sussex.